4/17 Issue 11 and 12 are getting close to being complete. Its taken longer than expected but it’s getting VERY close. 9/5 Kickstarter orders have been fulfilled! Thanks everyone for all the support! Work has started on Issue 11 and I'm planning on my next campaign to be three issues in length. I may not be doing the Kickstarter until I am a little closer to having all three done. I'll post it when I have a date for when that is happening. 4/11/2018 **Hardcover is sold out for the moment. I should have another shipment available in late May. 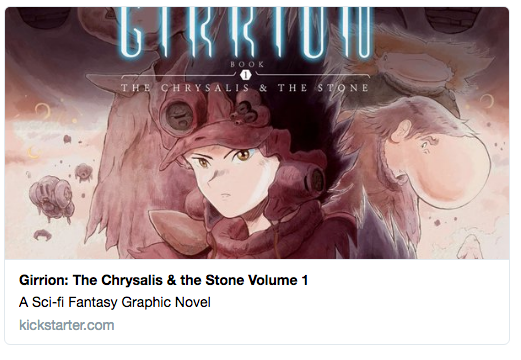 Girrion Issue 10 campaign is up! Check it out on Kickstarter.com. 2/6/2018 Apparently Volume 1 is still available on Backerkit. You can view the link here. 1/30/2018 Electronic versions of the book have gone out. I'm shipping books these next few weeks. Next-- onto Volume 2! 1/9/2018 I will be sending out orders in January/February. The next Kickstarter campaign for Issue 10, which is the first installment of Vol 2, will be as soon as the books have all been sent and everyone has received their order. Should be late Feb/ Early March. 12/11/2017 Preorders for Volume 1 are now available through Backerkit! I am currently working on the final 25 pages and plan to have the entire volume (225+ pages) done within a few months. I expect to be mailing out books this January. 9/27/2017 Preorder link coming soon! I'm setting up a page on Backerkit where most items available from the last Kickstarter campaign will be available. Should be up within the week and I'll be posting a link here, so check back for details. 9/6/2017 Volume 1 Kickstarter campaign was funded! Thanks everyone for the support. If you missed the campaign you can still preorder the book through BackerKit. I'll have a link soon. 8/21/2017 Volume 1 Kickstarter is live! Thanks everyone for your support. The campaign is going great so far. You can check it out here. Girrion is a graphic novel that's been over 15 years in the making! 10 issues are complete. The books are published by Scout Comics and available at your local comic book store. I also launch Kickstarters while I'm working on each issue. The Kickstarter versions of the books are available on the shop page as well. I've been getting some great responses from people online in regards to the Girrion Issue 1 Preview! Thanks so much. Your support means a lot and is very inspiring.